I recently completed a 1,300 round trip mostly on I-95, which gave me plenty of time to dream up some questions to share with you! At 1,920 miles, Interstate 95 is the longest north-south interstate highway in the US. What's the longest east-west interstate highway? It intersects with I-95. Along the way on Interstate 95, you'll travel through 15 states and DC, and encounter three state capitals. Name the state capital that is located between the other two. Interstate 95 bypasses two historic port cities that in what are now their respective states were the first European settlement; the British colonial capital; and briefly the first state capital. Both cities connect to I-95 via another interstate whose second digit is a "6". Of these two cities, which one is the shortest distance from Interstate 95? Although many segments of what is now Interstate 95 were originally built in the 1940s, 50s and 60s, to this day a gap remains in one state (to be eliminated by 2018). Which state is it? The missing section of Interstate 95 referenced in Question 4 will be eliminated once a new interchange with this toll highway is completed. While Interstate 95 bypasses downtown Washington, DC via the Capital Beltway, at one point on the bridge over the Potomac River between Maryland and Virginia I-95 is actually within the District for a grand total of 0.11 miles (581 feet). For which 20th Century U.S. President is this bridge named? Interstate 95 passes through this state in just 16.11 miles - and charges you a toll for the privilege! At the other extreme, name the only two states with over 300 miles of Interstate 95 within its borders. 3-digit Interstate highway numbers are branches off the main route. This 3-digit number (x95) appears seven times in different states, more than any other Interstate 95 auxiliary route. For a short distance on a circumferential highway near Boston, Interstate 95 and US 1 share the road in a "wrong-way concurrency" - as you're traveling north on 95, you're also heading south on 1. To make things more confusing, locals generally refer to this highway by a third route designation that pre-dates I-95. What is it? 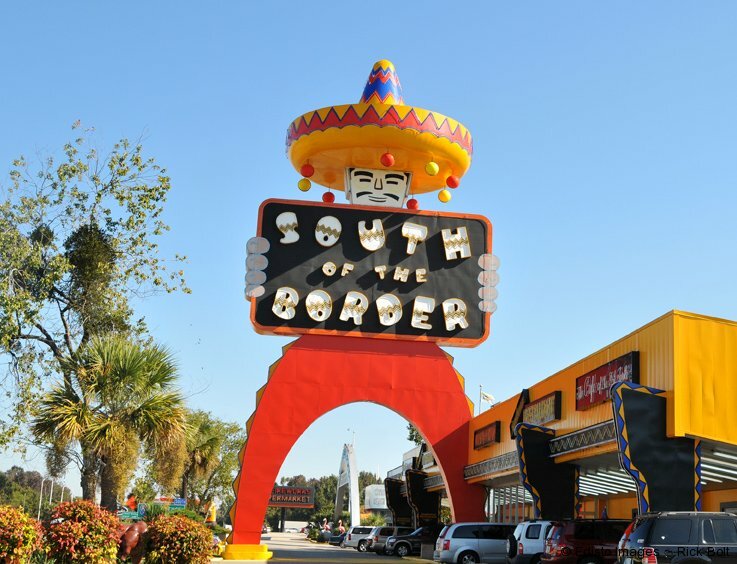 What state lies directly north of this Interstate 95 roadside attraction? In Baltimore, a tunnel takes Interstate 95 beneath the harbor. This underwater tunnel is named for what nearby historic site? Hope you didn't have to drive along Interstate 95 in this state back in 1983. In that year, a runaway truck rammed several cars at a toll booth, causing 7 fatalities. A few months later, a section of the bridge over the Mianus River collapsed, resulting in 3 more deaths. Due to its location along the Atlantic seaboard, you'll find few major climbs on Interstate 95. However, take the Naamans Road exit in this state, and in just a few miles you will be able to summit the state's highest point, 447.85 feet above sea level. Pictured here, the northern terminus of Interstate 95 crosses the border into which Canadian province?